The Bus Conversion - There are two types of bus conversions: the professional bus conversion and the do-it-yourself bus conversion. 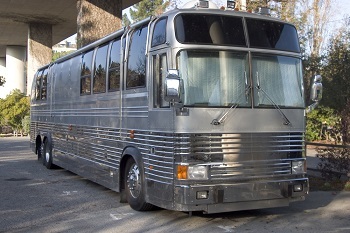 While a DIY bus makes a great home, it can be difficult to find comprehensive and liability insurance. So why own a bus conversion? A bus conversion offers a superior frame and chassis. The engines are built for miles and are even referred to as "Million Mile Coaches." Bus conversions can also be incredibly luxurious, so if you want to travel in style, a bus conversion is the likely choice! Toy Hauler- A toy hauler is a travel trailer with a large ramp door that typically leads to a room or garage in the back of the trailer that allows you to haul anything from motorcycles to smart cars. 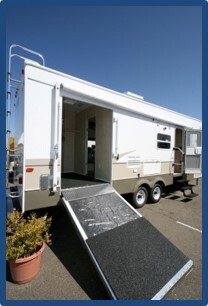 Toy Haulers are available as a traditional travel trailers and 5th wheel models. They range in length from 20 to 40 feet and often offer multiple slide-outs for more space. The garage can vary in length from a mere eight feet to a full 20! 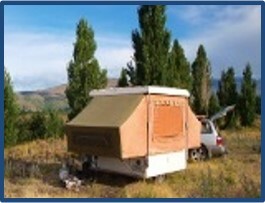 Pop Up Tent Trailer- A pop up tent trailer is a hybrid of a tent and travel trailer. This small camping trailer is lightweight and can be pulled by nearly any vehicle. Once settled into your camping spot, the tiny trailer converts into a raised tent, providing sleeping accommodations for up to six people. The most common style of pop up tent trailer uses fabric screening to enclose two extended sleeping rooms, one on each side. The A-frame pop-up tent trailer is a solid topped unit whose roof forms a peak to create a small sleeping room with kitchenette. Pop up tent trailers are also affordable. Many are less than $10,000 new!